Here are the reasons why I require a human development course for homeschool high school. I require a Human Development course for homeschool high school. 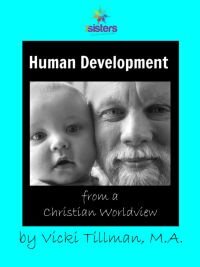 All of my teens have now used Vicki Tillman’s Human Development from a Christian Worldview curriculum. Why do I like this curriculum so much? * We are all humans. We should understand how humans grow and change through the many stages of life. How will we understand ourselves or the people around us if we never take time to observe and learn about the developmental process? * This text is truly written “from a Christian Worldview.” It starts with recognizing God’s amazing design, and then helps the student focus on God’s amazing plans for sustaining us through every new stage of development. * The material in the text is practical. The suggested activities are not only easy to do, they are fun and facilitate a real mastery of the subject matter. Whether my kids used this book in a learning co-op class setting or as an independent study course, they were able to implement practical applications of the material as they completed their book-work. * Studying Human Development strengthens a young adult’s grasp on health and interpersonal relationships. It blesses the student himself and the people around him. When my highschooler worked through the chapter on adolescents, he came to me and admitted that he was feeling convicted about not being enough of an encouragement to his 13-year-old brother. He said studying that chapter opened his eyes to how hard it is to have self-confidence when your body, voice, and emotions are all in flux. * The subject is foundational for college coursework in your student’s future. My daughter is took Human Development at Towson University. She had confidence for taking that college class based her introduction to the material at high school level. When you require Human Development for homeschool high school, you are giving your teens a great life preparation. Download your text today! Follow Vicki’s Homeschool Human Development Pinterest board and 7Sisters Human Development Pinterest board for lots of resources to enrich your Human Development experience. Previous Post: Homeschool High School English Credit: What’s Included?